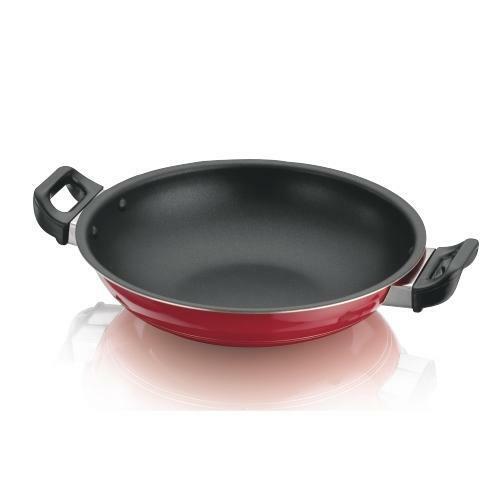 > Supreme Cookwares Pvt. Ltd.
Providing you the best range of Classic Shallow Kadai, Classic Deep Kadai, Fortune New Deep Kadai, Forge Deep Kadai, Ignite Dosa Tawa and Classic Appam Kadai with effective & timely delivery. Reckoned as one of the eminent business organization, we are readily engrossed in the arena of presenting to our clients a broad variety of Classic Deep Kadai. These are designed and developed as per the prevailing development making utilization of top-class components altogether with modern machines. Also, their accessibility with us in a consignment of sizes makes these products enormously recommended. Leveraging on our massive business competence and know-how of this particular arena, we are readily immersed in presenting to our customers an all-inclusive variety of Fortune New Deep Kadai. These are developed with perfection making use of finest class inputs and machinery. More to this, we guarantee shipping these at the end of our patrons on time. Cook a quick and healthy meal using this heat-efficient Forge Deep Kadai from Suruchi. Made from strong and lightweight aluminum material, this kadai comes with a 3 layer of coating for extra durability and can be covered with a glass lid to preserve nutrients. This kadai with 3-mm thickness has sturdy handles with durable rivets. This deep kadai can be used with minimum oil to cook a complete family meal. Prepare your meals without any kitchen hassles with this stylish Flat Griddle Tawa from Suruchi. Ideal for cooking dosas, pancakes, and eggs, this tawa features a 295-mm flat griddle surface made from light and durable aluminum material. Compatible with any induction cooktop, this tawa is easy to wash and maintain after use. With 3-mm thickness, you can use this efficient flat griddle tawa to cook a healthy breakfast or snack for your family.